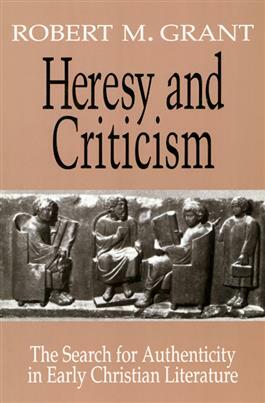 Robert Grant draws upon his fifty years of experience dealing with the correlation of early Christianity and classical culture to demonstrate that Christian "heretics" were the first to apply literacy criticism to Christian books. He shows that the heretics' methods were the same as those of pagan contemporaries, and that literary criticism derived from the Hellenistic schools. Literary criticism was later used by famous orthodox leaders, and, as time passed, orthodox critics increasingly found that these methods could serve them well. Grant supports his argument by focusing on principal figures Origen, Dionysius of Alexandria, Eusebius, and Jerome.